Ah, Necromunda, how I've missed you! I have been cautiously optimistic about the upcoming release of the updated Necromunda and while there are a few things that I find disappointing (the rules for only two of the six original house gangs being included at release being the big one), overall I'm rather liking what I'm seeing! As I recently finished off one army and made great strides on another, and with the new plastics hopefully in hand and then on the painting desk in another week or so, I didn't want to undertake a massive new project. So something Necromunda-themed it is! Rooting around in the darker depths Closet of Doom I uncovered the old, old cache marked "Necromunda Terrain", and after blowing the dust off of it unpacked it to see what treasures lurked within. I was immediately buried under a tidal wave of the old plastic bulkheads - over 150 of 'em in point of fact! I didn't have the space to lay them all out of photos, but over the last couple days I was able to get them primered in batches and have started dabbling in various weathering and whatnot. 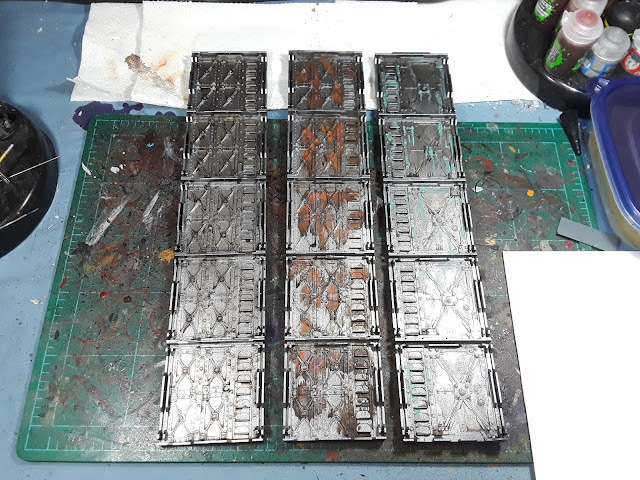 Tried some greasy oils, some rusty patching and some dripping verdigris/slime, to varying degrees of success. Has been a hoot experimenting though! Going to do some graffiti and perhaps some posters on some of them as well - There's plenty to mess with. Really glad to hear that the Gang War book includes rules for 3D terrain, while the Zone Mortalis aspect of the sounds fun to me one of the best parts of the game was the claustrophobic blasted hivescape terrain! One can only dream of finding a box like that !! Looking great, mate! I particularly like the rust effects you've achieved there. 150 . . . not even a challenge! Looks like my gaming group are not pulling the trigger on nu-necromunda as the gang progression does not look as involved. We may be wrong but that is certainly our first impressions having managed to get a sneaky look at the rule book before the release date. We will probably end up playing 2nd edition Necromunda but with the new kits. @DaveTaylor: Thanks man! Been experimenting, and it's nice to do on terrain where I can be messy and try out various effects. @Riot: Cheers! Aye, the rules in the base box are a little thin, the Gang War add-on book has all the campaign stuff and rules for the old school 3D terrain. Still doesn't have the other 4 Houses which I think is a shame, but it's been stated that the Delaques, Van Saars, Orlocks and Cawdors are scheduled for released throughout 2018. Brilliant mate, glad others are getting their old Necromunda bulkheads and terrain out. I just quickly sprayed mine Leadblecher but I may have to get them out again to experiment weathering. Sweet Loki man! How big is the closest of doom? @Siph_Horridus: Indeed! Really liking the resurgence we're seeing! @CJ Kilbride: Excellent! Looking forward to seeing 'em! @Zab: Totally, absolutely cannot wait to get my mitts on it!